Beat the heat with our refreshing Iced Tea Popsicles. Place tea bag in a mug and steep in boiling water. Leave to brew for 3-5 minutes before removing tea bag. Add honey and stir until dissolved. Place 2 cups cold water in a jug, then add tea mixture and stir to combine. Divide tea between 6 popsicle moulds. 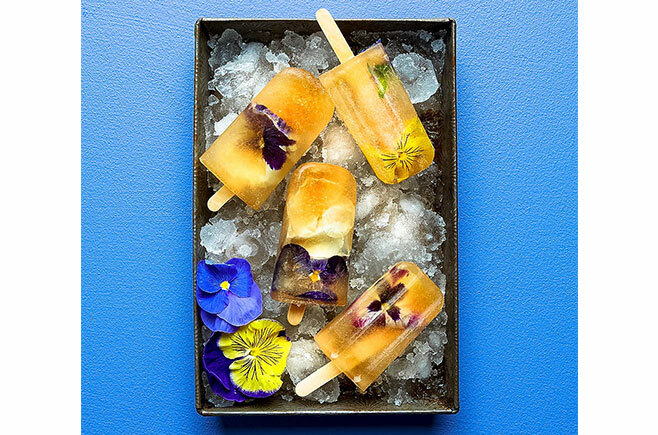 If using edible flowers, distribute them into each mould before adding the popsicle sticks. Place in freezer for 6 hours or overnight until set. Remove from moulds before serving. The recipe for Iced Tea Popsicles recipe first appeared in Issue 15 of Australian Gluten-Free Life. Pick up a copy in our back issue store today for more ways to stay cool this summer. Iced Tea Popsicles – Recipe by Cara Boatswain | Photography by Brandee Meier.